Francine's father's family in London, England, ca. 1913-1914. First row, left to right: Pearl (Paula) Laufer (Lefer), Francine's aunt; Joseph Laufer (Lefer), Francine's cousin; Alice Ajzensztark, Francine's aunt by marriage; Anna Ajzensztark, Francine's cousin. 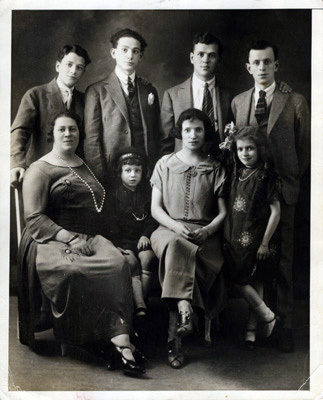 Back row, left to right: Henri Ajzensztark, Francine's cousin; David Ajzensztark, Francine's cousin; Mortre Mendel Ajzensztark, Francine's father; Max Ajzensztark (Manus), Francine's uncle.